I really enjoyed making the Retro block from Camille Roskelley’s book, Simply Retro. The block is simple to put together and has a fun final look. The first one I made was with orange and purple. 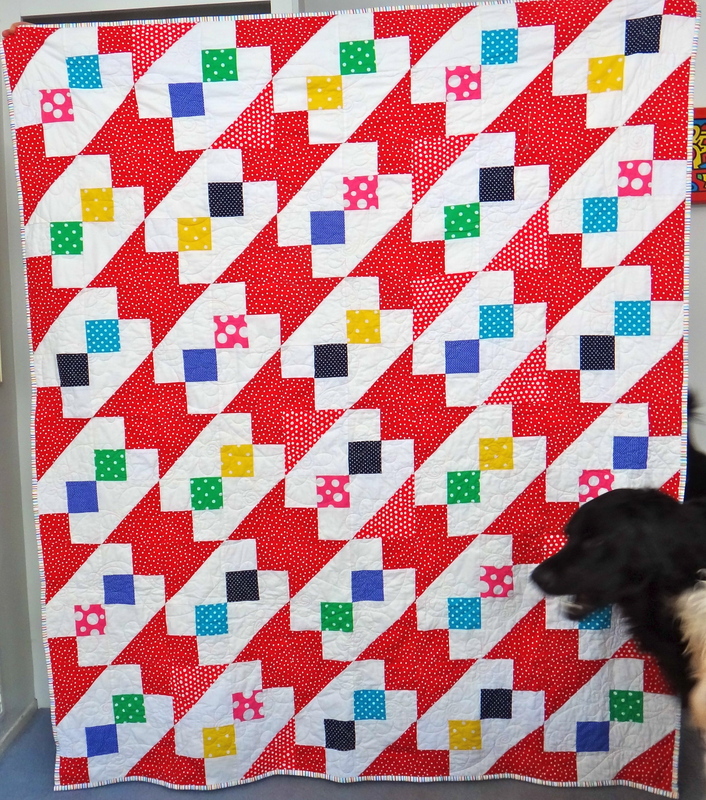 As I was making that quilt, I thought I’d make another with the red and white. This is the first time I made two of the same quilts back-to-back. 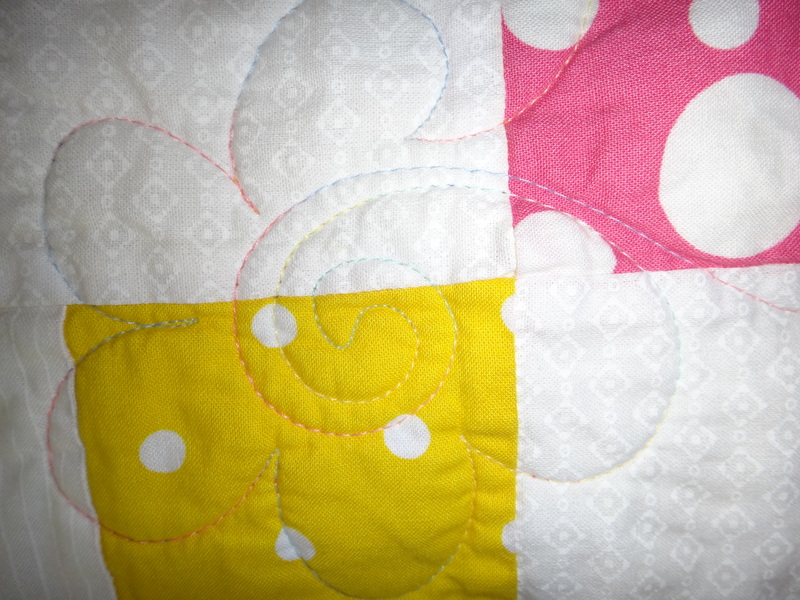 My friend Sondra quilted these super cute daisies into the quilt. I love them! 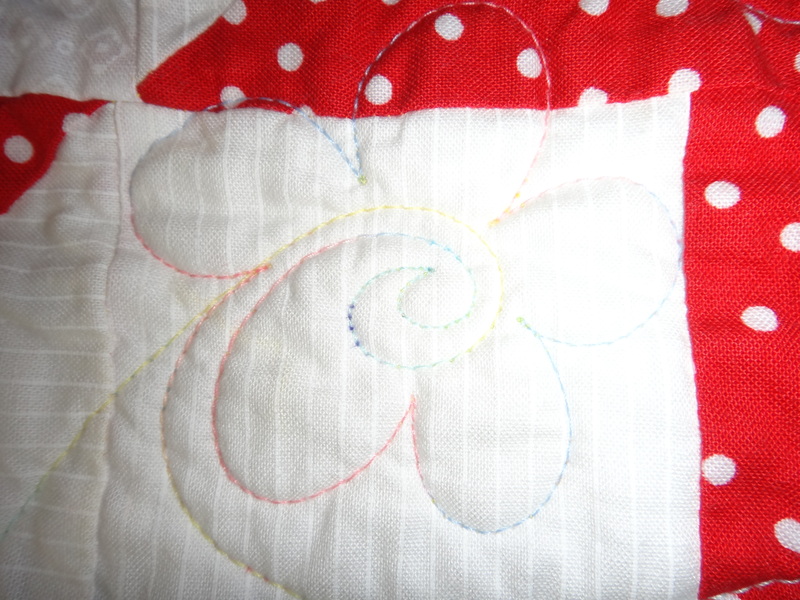 Here are a few close-ups of the quilted daisies. 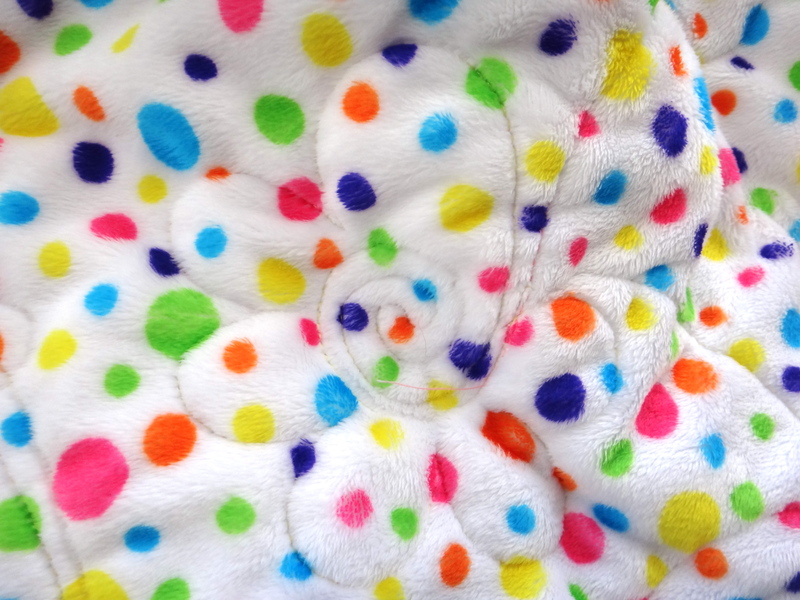 The back of the quilt is a minky fabric. Very, very soft! 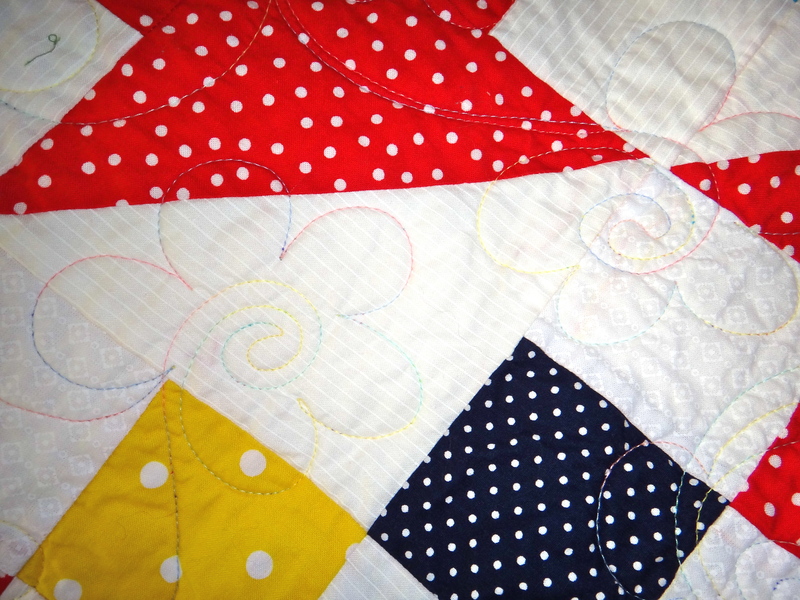 Hi Shauna – thank you 🙂 I was just at your site admiring your Skipping Squares quilt with the bird fabric on the back – very pretty! Thank you 🙂 The daisies make me think of Springtime! Thanks Jan! I had a lot of fun making it! It went together quickly because I was so excited to see how the red and white was going to look! What a great pattern! DEFINITELY putting this one on the list of to dos!! Awsome! Thanks 🙂 I totally recommend the pattern! Fun, easy and great results. Thank you Sara! Such a simple block to make, plus it is fun to look at. Love it! I can’t wait to make a quilt with a Minky backing. Hi Diana! I love Minky! It is just so soft & irresistible! This is a great pattern, and you picked great fabrics for it! Cute minky on the backing too! It looks lovely in red. 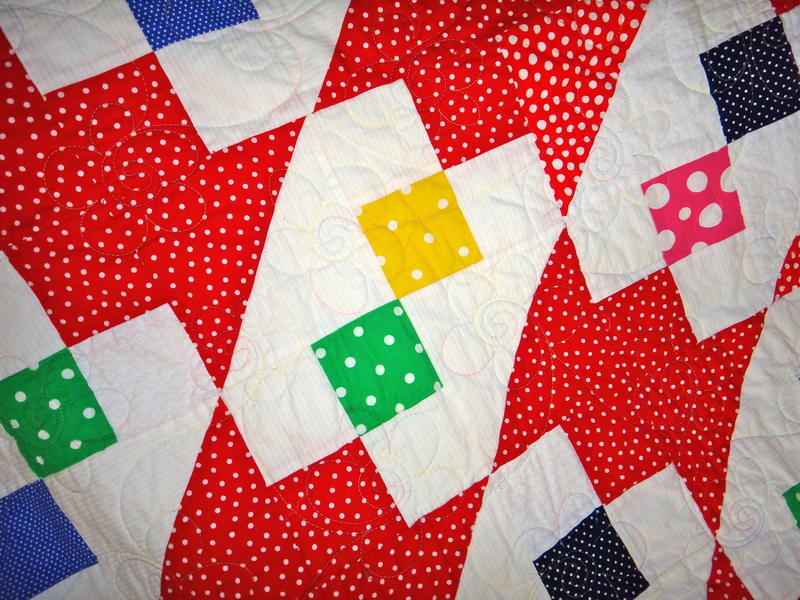 A very happy quilt. love the minky on the back. Thanks Karen! Glad to see you are back on line again! Looking forward to seeing what you’ve been working on!